Optimizes the working conditions – with focus on safety! 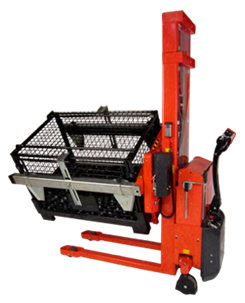 The Rotator with adjustable box holders is a unique and flexible solution for companies, requiring handling of boxes with different widths. The width of the box holders is adjusted by a handle, so that the width fits the different box sizes (widths between 31.5” and 47”). One box holder can manage 2200 lbs, also when tilting more than 90°. Box holders with clamps can hold boxes of heights between 15” and 34.25”, when tilted (also 180°). Box holders with clamps are recommended when tilting more than 60°. Tilting function is deactivated when the rotation center is more than 46,50″ or less than 27″ above the floor. The Rotator with non-adjustable box holders is the solution, if handling of different box widths is not required. Two box holders are required, when tilting between 1760 lbs and 2200 lbs. Box holders with clamps can hold boxes of heights between between 15” and 34.25”, when tilted (also 180°). For box widths of 31.5”, 33.5” or 39.5” by a fork span of 22”. For box widths of 39.5”, 41.35” or 47” by a fork span of 27”. Special arrangements for a maximum box width of 55” are possible. Tilting function is deactivated when the rotation center is more than 46,50″ or less than 27″ inch above the floor. High flexibility and efficiency – with the Rotator Reel Clamp heavy reels can be transported, lifted and rotated 90° to each side. The Rotator Reel Clamp has a fixed arm and a movable arm, gripping the reel during rotation. The movable arm is controlled by a Linear Actuator (with remote control). The Actuator has a built-in torque unit, ensuring that the appropriate level of grip is achieved. Furthermore the gripping pads are rubber covered to ensure a gentle grip. The Reel Clamp is factory fitted on the Rotator – and is available on Rotators with or without straddle legs. Available as both manual and fully powered propulsion.